Joys so sweet that they would remain forever etched in heart! Such are the bliss of dedicating a day to siblinghood and acknowledging the bond of love. Make sure the distance doesn't weaken the sweet bond. Send Rakhi to Mumbai and evoke happy feelings in your brother. On the festival of Raksha Bandhan brother and sister express their love and care for each other. The ceremonial thread called rakhi is tied around brother's wrist by the sister. Sweets are the other special segment of this ceremony. The return gift given by brother is a simple token of love for sister. No matter if the sister and brother are geographically separated, you can send rakhi to Mumbai online through Floweraura. We are online gift vendors so if your beloved brother or cousin is living there in that town we will be happy to send rakhi to Mumbai on your behalf. Through our online portal, anyone can send rakhi gifts to Mumbai. We have rakhi collection that are well combined with traditional and modern essence to name a few we have American diamond rakhi, silver rakhi, chandan rakhi, rudraksh rakhi, kundan rakhi, pearl rakhi, gemstone rakhi, special cartoon rakhi for kids, lumba for sister-in-law and so on. We assure you fastest delivery of the Raksha bandhan gifts to Mumbai to add more happiness to the day. You need not worry about the timely delivery with our team of workers as we have same day delivery to ensure on time delivery. 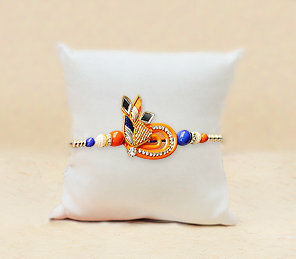 Just like you for us as well, Rakhi is not just a thread sequenced with embellishment. It is the thread embellished with love and affection. So, to send rakhi for brother from FlowerAura and make him happy, all you need to do is book with us and of course, our service include free home delivery. The city of Mumbai aptly called as the city of dreams. And if your brother is posted in Mumbai we won't let your dream of his wrist tied with Rakhi not go in vain. After all, it is the festival of Rakhi. Every year you have sweetened his mouth with his favorite sweet. And we won't let that pattern change. With us, you can also try the best combo available in the form of rakhi with dry fruit hamper online, which is highly in demand. We have some other ideal gifts packs such as Rakhi with chocolates, fresh flowers, sweets, cakes which all are very popular and we have features of free shipping as well. It is Rakhi and there is no better day to tell your brother as to how much you love him. So send him Rakhi with chocolates, sweets or flowers from our web portal we also have today delivery option. There are also gift hampers for the Rakhi day which inculcate special gifts and delicious sweets. We assure that the sweetness of your love will reach your dear brother on this auspicious day. Raksha Bandhan is not just a ritual. It's a fond way of remembering all the little spats that brought you closer, big arguments that matured your relationship, caring words that healed, laughter that always seems endless. There's so much to celebrate about a brother-sister relationship or any siblings for that matter. Floweraura believes in spreading Happiness thus helping you express your love in the most beautiful way and by instant delivery feature. Wishing you all a Very Happy Raksha Bandhan. It so happens that you move away to some other country and the distance between you and your brother grows. And there are times when you miss him the most, especially during occasions. Rakshabandhan is one such occasion that celebrates the bond of a brother and a sister. You have been celebrating the occasion since childhood with your brother but now that you have moved to some other country, you still have a chance to send Rakhi to Mumbai from USA, UK, Australia, Canada, UAE, Dubai, Germany, Singapore, Saudi Arabia and let your brother know that distance cannot fade the love between you two. So this Rakshabandhan, make your presence felt to your brother by ordering scintillating Rakhis for your brother from FlowerAura.